NOTE: The Post-Baccalaureate Certificate does not qualify for federal financial aid. 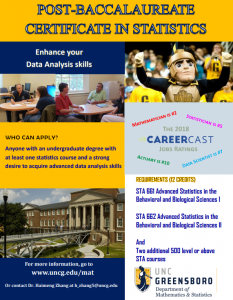 The Department of Mathematics and Statistics offers a graduate program of study leading to a 12 hour Post-Baccalaureate Certificate in statistics. The purpose of the certificate is to provide statistical training for persons who wish to enhance their knowledge of statistics but do not wish to pursuer a formal degree, and is intended for professionals whose interests require a knowledge of statistics beyond the undergraduate level. The objective of the certificate is to offer a structured introduction to the basic ideas of graduate level statistical analysis. To find out more about the program and its requirements, see Statistics – Post-Baccalaureate Certificate in the catalog.